Is Gaultheria Right for my Garden? Gaultheria procumbens makes an excellent evergreen shrub, growing to only 30cm / 1ft high. Small white / pink flowers in July and August then red berries into late autumn. The foliage turns reddish in winter. There are several forms of Gaultheria though procumbens is one of the easiest and most useful to grow in the UK. They originate from North America. It is sometimes known as the Checkberry plant. They are low growing spreading shrubs which reach a maximum height of 30cm / 1ft and an almost indefinite spread if left to their own devices. They can easily be controlled. The green leaves are evergreen turning to a slight pink hue in winter. In July they produce small, light pink flowers in varying amounts which last until mid August. These are then followed by attractive red berries which last until November. They grow best in partial shade and tolerate full shade well. They do not do particularly well in full sun. They prefer a slightly acid soil though a neutral one will do fine. They dislike alkaline soils. Established plants require no attention other than an annual prune to shape. Pruning consists of taking a spade and digging up any spreading surface roots. A 15 minute job each year. They are hardy down to -10°C so should survive well in winter for most areas of the UK. They make excellent container plants with interest from July through to November. Some parts of the plant can cause significant nausea if eaten. The berries however appear to be the least harmful part of the plant. Choose a position in partial or full shade. The soil should be neutral to slightly acidic. When planted directly in the ground they can spread without limit through shallow spreading roots. Allow at least 75cm / 2ft 6in for the plant to grow. When established a Gaultheria procumbens will look after itself. It needs watering in dry conditions and we suggest that natural rainfall is best rather than tap water. It will grow quite happily on average ground without the need of additional feeds. Pruning is not required for the first three years. After that, dig up the shallow roots where it is beginning to spread too far. This can be done at any time of the year. Gaultheria procumbens produces seeds which can be sown to produce new plants. It is self-fertile and only one plant is required to produce viable seed. Many other Gaultheria varieties are dioecious (require separate male and female plants to produce viable seeds). Gaultheria procumbens can also be propagated by semi-hardwood cuttings taken in August to September time with a good chance of success. When first planting them use ericaceous compost which is slightly acidic. After that treat them as normal. Many garden centres sell Gaultheria especially from August to November when the attractive berries are present. They are also commonly sold online. Crocus sell these plants at a good price and they have our personal recommendation. Below we list the key strengths and weaknesses of Gaultheria. QUESTION: Can gaultheria be grown as houseplants? ANSWER: Gaultheria can be grown as houseplants with care. They need lots of indirect sunlight (morning direct sunlight is fine) and are best kept on the cool side 60F / 16C for most of the time although they will withstand higher temperatures in the summer. Feed sparingly, Gaultheria as houseplants, thrive on neglect. QUESTION: Can i water my gaultheria from the bottom? ANSWER: Yes that's fine to do that. In most cases it's probably the best way to water. QUESTION: Do birds like to eat the berries of the Gaultheria? Will the plant attract birds to my garden? 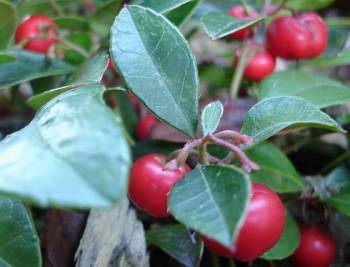 ANSWER: Birds are not particularly attracted to Gaultheria berries. They will eat them if they are very short of food.